Item #148: 1" long 14Kt. 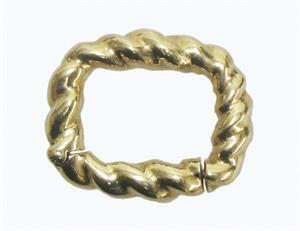 Yellow Gold bead shortener. Item #6677: 14Kt. Yellow Gold Pearl Shortener with one bezel set 14mm round Black Onyx Cab and six round Diamonds of .09 cts. TW bead set in White Gold. Item #AG-6715: 14Kt. Yellow Gold Pearl Shortener with one bezel set 13mm round Mabe Cultured Pearl and three round Diamonds of .045 cts. TW bead set in White Gold.